It's mostly the thick part of the bottom loop that needs thickening, I think. Even more. Imagine the angled nib on the top-left-to-bottom-right strokes—because a broad-nibbed ductus is fundamental to this style, only thinned at joints. You might also try thickening the x and y accordingly. Instead of focusing on details, which are mostly relative to the concept and hence somewhat easy to judge, at this development stage it might be a good idea to thoroughly evaluate and consequently question your overall concept still. In contrast to Granjon’s original, which is a very strong design showing a full control over counters, an even distribution of weight, and perfectly crafted details (nicely interpreted by Matthew Carter, hence I use ITC Galliard Italic for the comparison below), your design is somewhat more irregular. 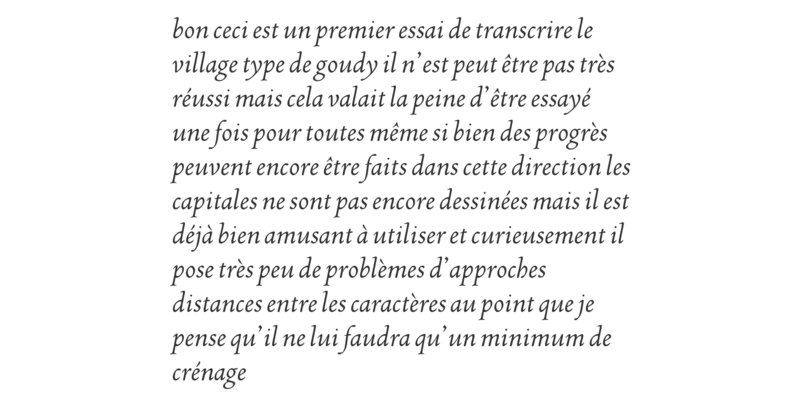 Irrespective of whether this was intended, this irregularity (and its effect on the spacing) is perhaps something to reconsider, especially if your typeface is meant for setting larger texts, i.e., not speciﬁcally developed for display purposes –if you want to proceed with this model as counterpart for your roman, of course. More work with the softened Arrighi inspired version. That seems already better adapted to Uccello. Not sure how your sources handle it, but I like when /h/s with that structure dip their final terminal a little below the baseline. Otherwise that foot can look a little floaty, and the letter also be more likely mistaken for a /b/. The /u/ may be a little too wide. This is a handsome counterpart for a handsome roman--lovely to look at and a pleasure to read. I don't recall your intended size for this. It looks on the light side for text, but of course much hinges on printing or display variables. @Craig Eliason Thanks for your comments and your appreciation ! I tried some changes on the glyphs you told. I changed also the /g curl. I still didn't try to print the italic, but the roman prints fairly well and gives nice homogenous pages. However I will certainly do book versions in the future. Oh, and looping part of /k/ feels a little pinched. y v and w seem to break the rhythm a little bit. @Jasper de Waard Thanks, you are right. Their swing is nice but it remains something which breaks the jump. Yes, the downward diagonal sticks out in /v/w/. Maybe use something round-bottomed after all? The /f/ strikes me as too sleek, it could use a stronger crossbar and more curvature at its ends. Nice overall! 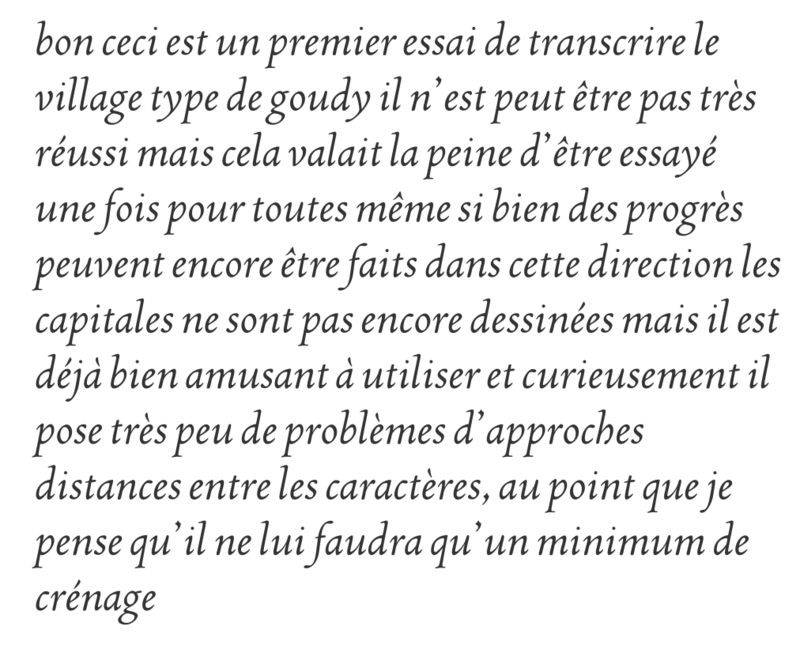 I also hope you find a good use for that very tight italic in the OP; it's very striking. I worked on many glyphs today. And tried to solve /v /w diagonal. /y still needs some work. @Christian Thalmann I work a little bit on /f . It's more discrete now but I didn't change the crossbar. I will sure do it soon. And the /t crossbar too. Those /v/w/ are working fine I think. I'd make the tittles a little larger. /o/ reads as more upright than the other letters; is that intentional? @Craig Eliason Sorry for the delay ! I have redrawn and retouched many characters. Thelast ones were /u which is now closer to an inverted /n, and /o where only the external path was slightly rotated (not inclinated) to the right ; I didn't touch its counterpunch and the overall remains slightly upright. The /f is also more upright, the /e has more weight, the /y a shorter tail. But I have still a lot of changes in project. The last version harmonizes a lot better. 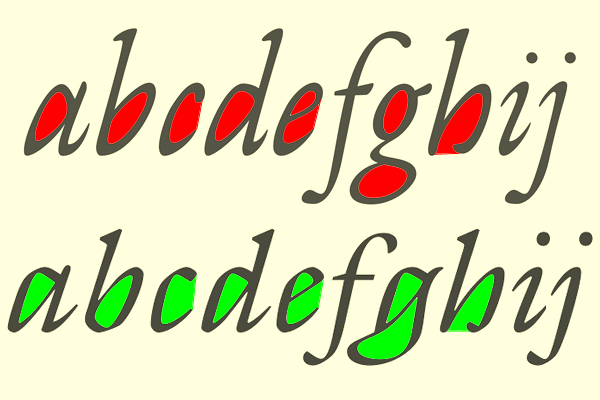 In the initial version the bottom serifs in the descenders of p and q stuck out to me, but they work better now being more connected. To my eye the ascender serifs are somehow uneasy. Either they need to turn less abruptly, or be less long and pointy, or bend the stem a little to the right where the stroke turns downward; right now they make those letters appear a lot more stiff than what is going on below the x-height. The tittle feels very light and too perfectly round. In the y the teardrop seems a bit too engineered, by comparison the right leg of h feels a lot more natural in that regard. Great work, curious to see more! @Johannes Neumeier Thanks for your comments ! I will see what I can do about ascender serifs and tittles. About the /y teardrop it still needs some work like need the two /f teardrops, the /g ear and /f and /t horizontal bars. The /f/ still strikes me a bit spineless and a touch too light. Very pretty otherwise! A narrower contextual alternate for that /f/ might also be worthwhile. Have you tried setting something like «saugfähig»? More work on /f , /g and many others. 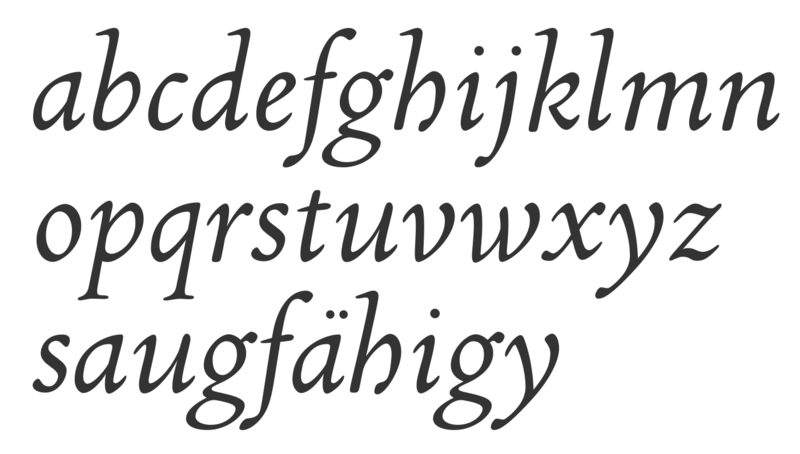 And also on ascenders end descenders length. No changes at the moment in upper ascenders serifs. 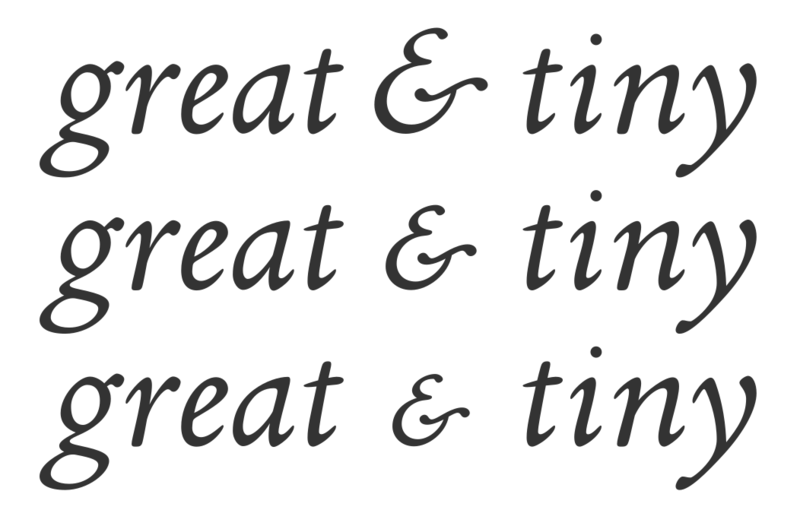 Horizontal bars in /f and /t should be changed in the future and in prevision of ligatures. Capitals remains dummies but not so bad ; they need more weight of course. I need advice about my ampersand. Chiefly its skewing. Is it too much or not ? Right spacing is probably too much. It should be moved somewhat to below and I probably also added too few weight to the Small Caps and Petite versions. The italic angle of the ampersand seems noticeably steeper than the rest, to me. Trying to uniformize ascenders upper serifs horizontality with transversal bars of /f end /t (now ready for future ligatures) and bottom serifs of /p and /q. That gives a better horizontal stress and less wavy lines. This is coming together very nicely. You might want to have a look at accent placement, though. For my taste, the grave is too far left on è and too far right on à, for example. @Christian Thalmann Thanks a lot, I will take a look at that. 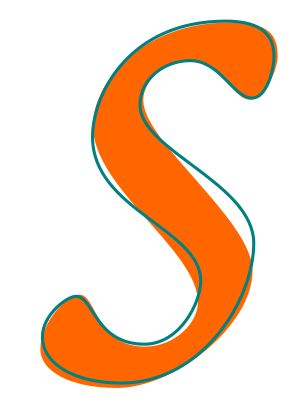 This morning I have redrawn the /s more upwards and its top and bottom ends slightly more ecarted. It looks much better for the flow. Before that I had the illusion that a more "nervous" /s could have a better dynamics, but I was wrong because it was too stressed among other glyphs and drew too much the attention to it. The new /s is the orange one. It also sticks to the base line while the previous one didn't. I stopped to work for some time and came back a few days ago. Many tiny changes and one more visible on the bottom of /h /k /r /m /n which gives a better dynamics.